I got a new toy the other day. 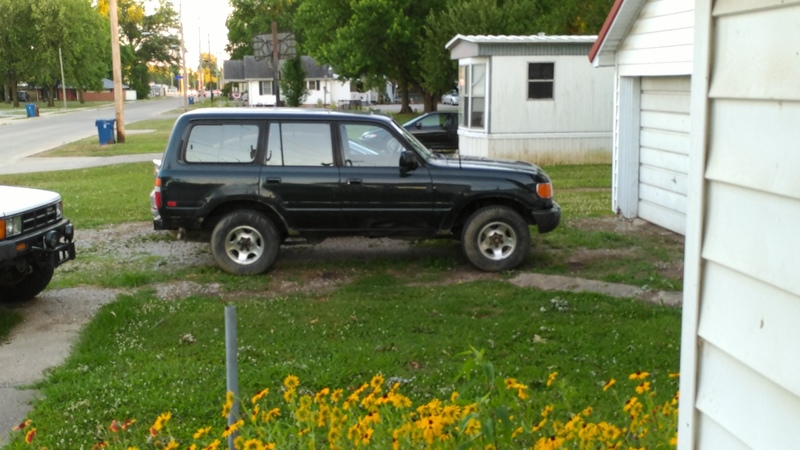 It's a 1994 Land Cruiser that has front and rear e-lockers. There are a few things wrong with it, but I think I can make a good toy out of it. 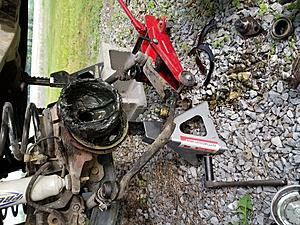 Its been wrecked so the frame, body, and front axle are a little out of whack. 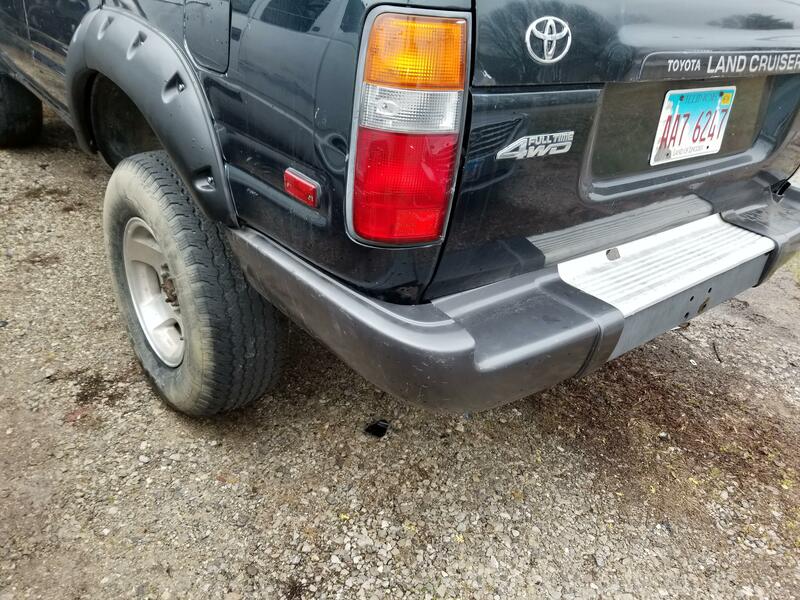 It tracks straight but the wheels are off center in the front wheel wells. 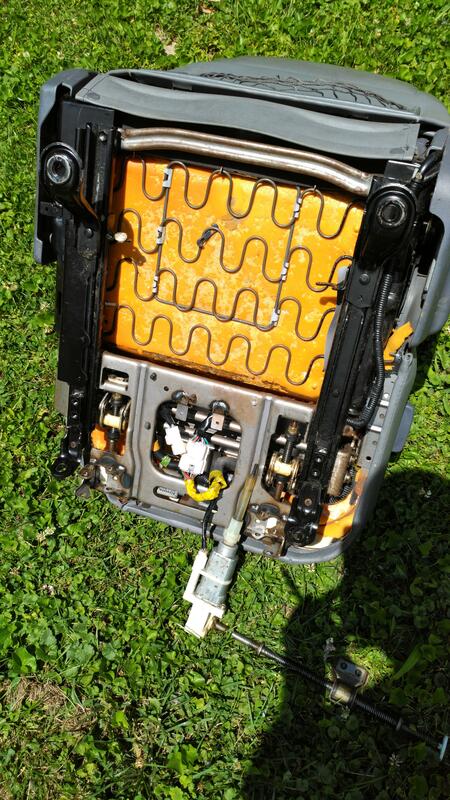 The front passenger seat had a gear stripped out in it. It came apart easy. The old gear had turned into mush. 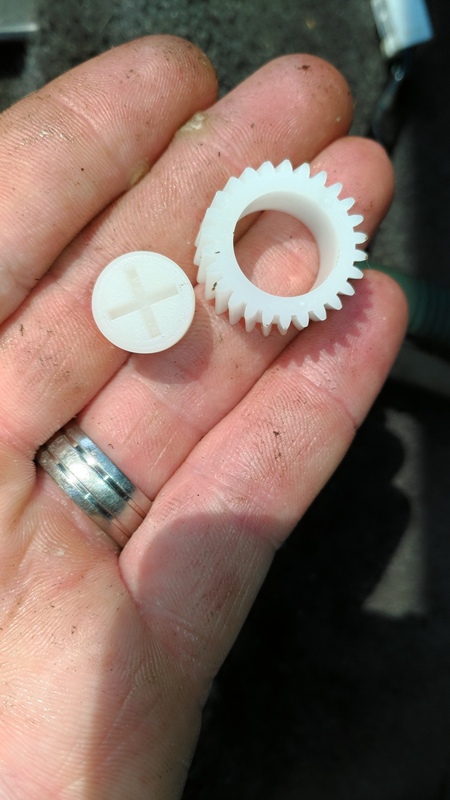 The previous owner had provided the gear and the cap. I'm not sure why he hadnt done it himself. The gear presses on with a socket and a hammer. I removed the fender flares. One had a big hole torn through the fiberglass. The rest where in okay shape but were loose in places. After i got them off I plugged the holes with rubber plugs I got in a set from eBay. The black rubber blends in well with the dark green so I am satisfied with how it looks. 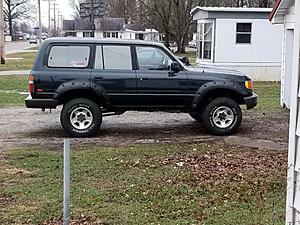 It makes the cruiser look smaller and a little more sleek after the flares are gone. The next thing to do on my list was a leakey rear passenger hub. I ended up with a big surprise when I got in there. 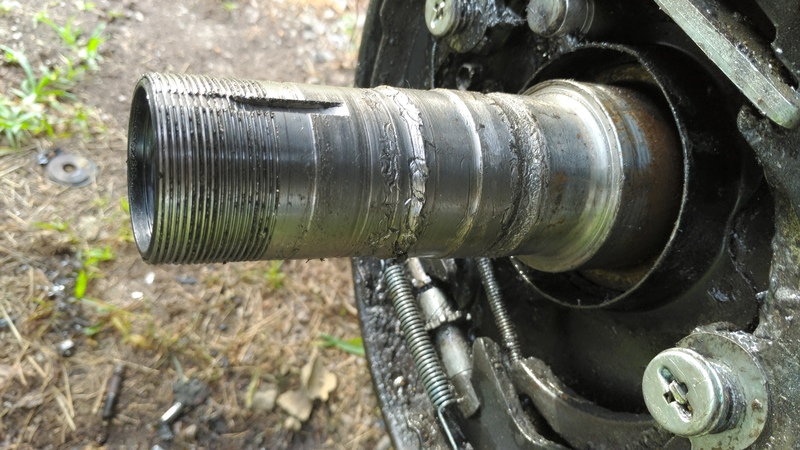 It turns out that not only had the seals failed, one of the bearings failed spectacularly. 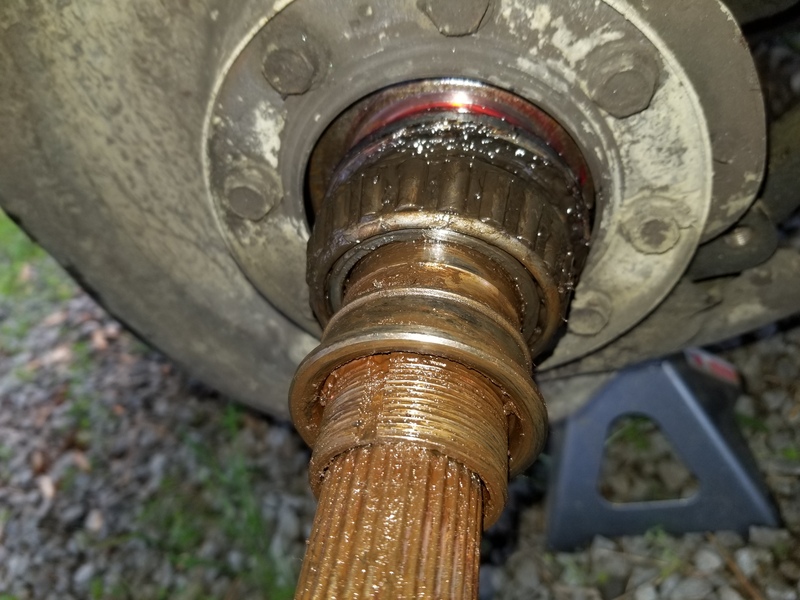 My outer bearing had failed and filled the hub with loose needle bearings which caused a ton of damage. 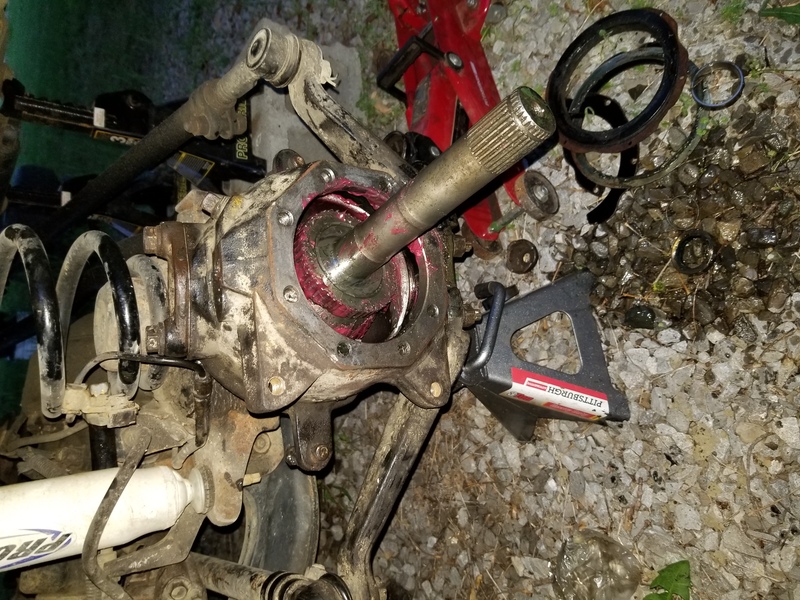 Technically the entire axle housing needs replaced now but I replaced the bearings and seals and I'll use it until it causes these bearings to go bad. It may last a month or 10 years. I have no idea. 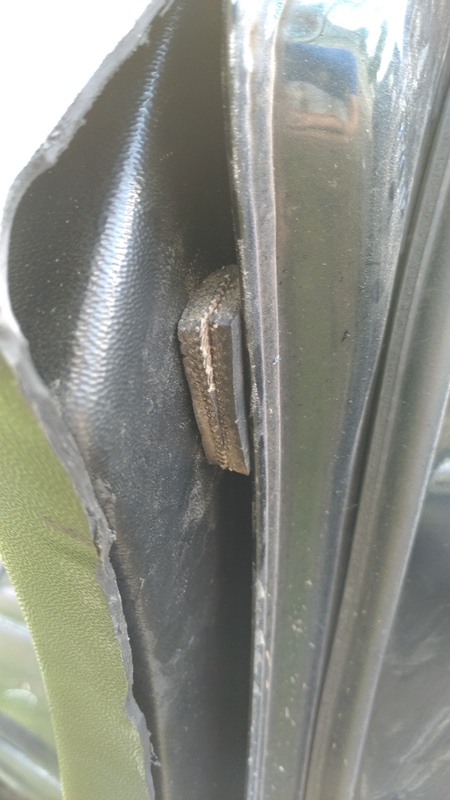 Luckily the area that the bearings seat in had been spared by the body of the old bearings so the damage was in the in between area. I had to file some of the roughed up metal to get the new bearings to clear and even then it took too much force the seat the new bearings. 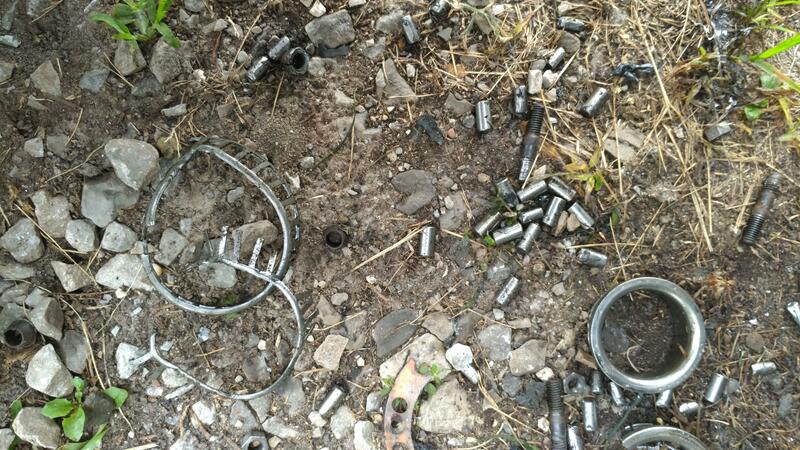 The threads for the hub lock nut were marred as well and it had to be beaten in place. 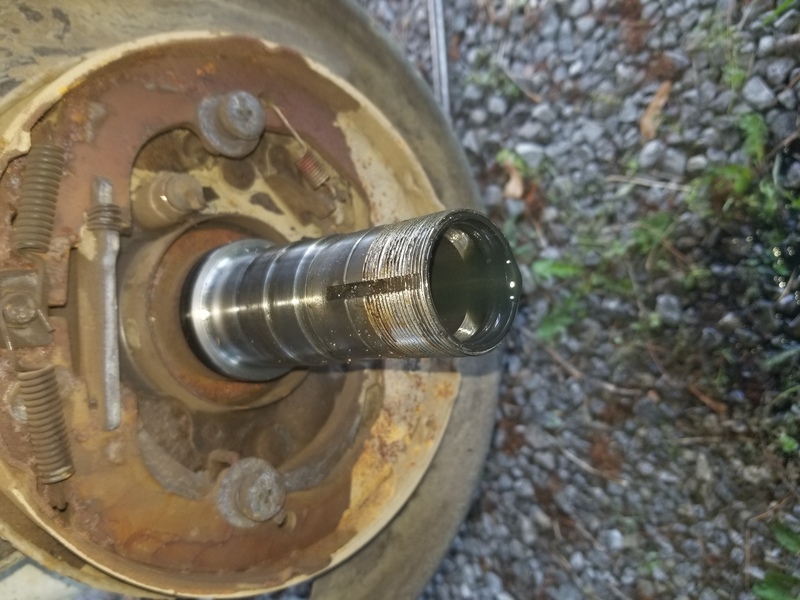 But after a couple mile test drive I didn't hear any complaint from the new bearings and I believe it is holding its oil in. 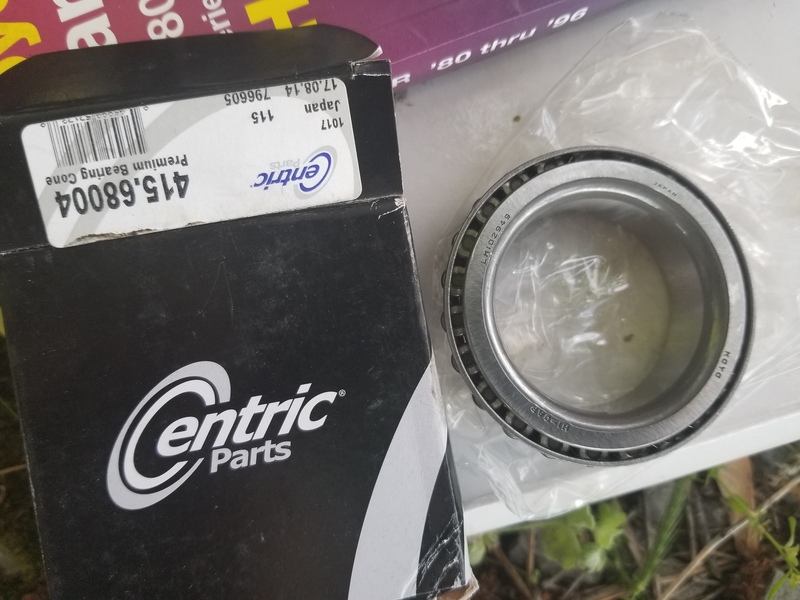 Luckily I had gone cheap on the bearings and seals (30 bucks from rock auto) if I had bought real toyota parts I would have ordered a salvaged housing and gone the extra mile. And I would have done the other side while I was at it. I'm a little scared to crack the other side open. At least it is still sealed up. 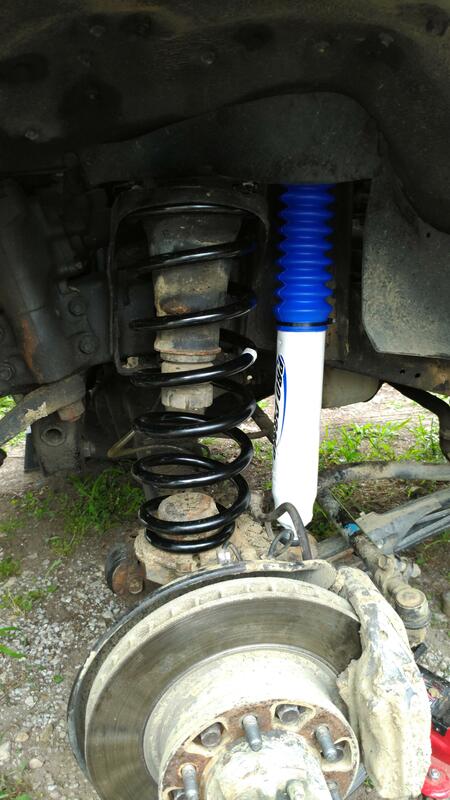 I replaced the springs and shocks this weekend. I decided to give it a little lift while I was at it. 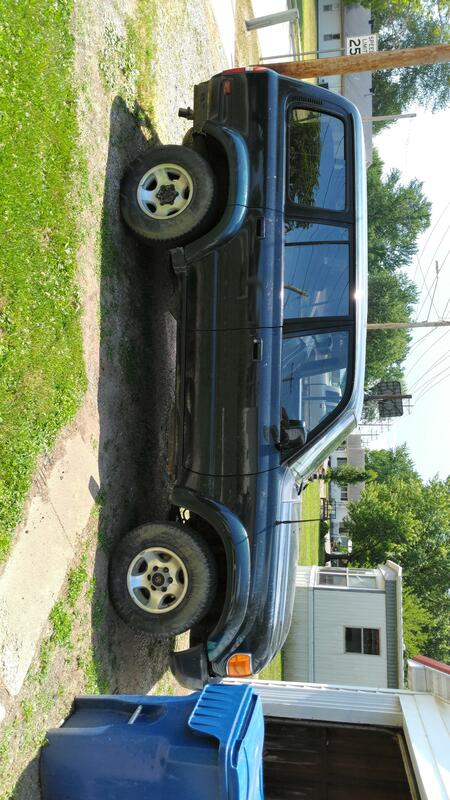 I got OME 2" lift springs, medium weight, and some pro-comp ES9000 shocks. 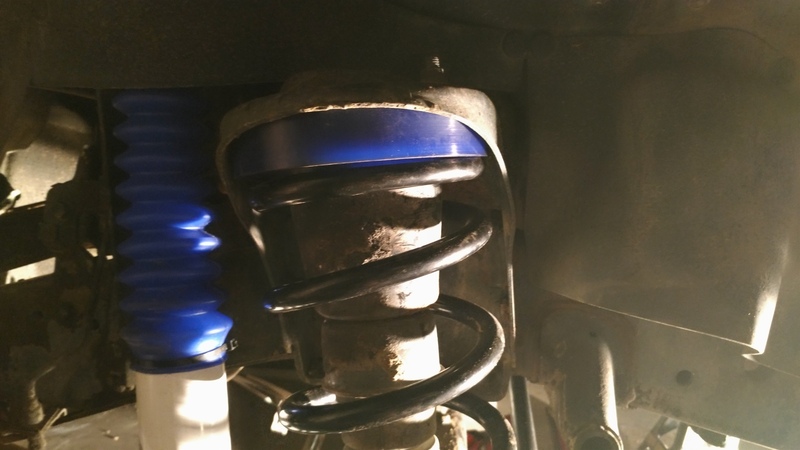 The pro comp stock height shocks are an inch or so taller than factory so they should do just fine. I have ES1000 shocks on my '86 pickup and they have held up nice so I hope these will too. 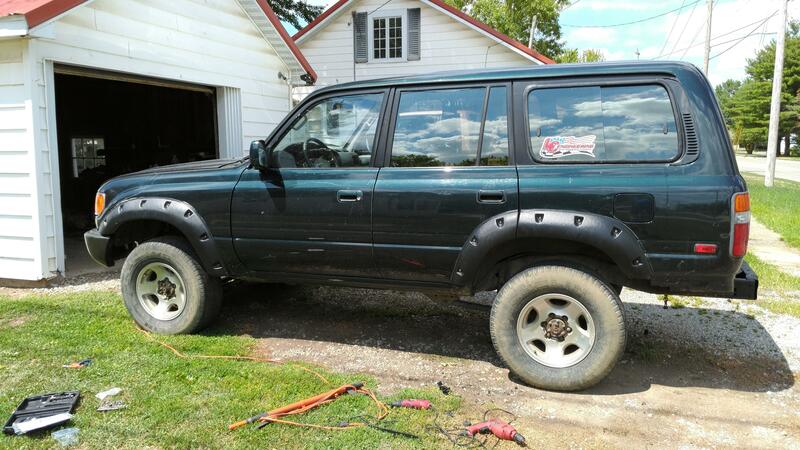 Now the land cruiser doesn't have the old lady car floating feeling so bad now. 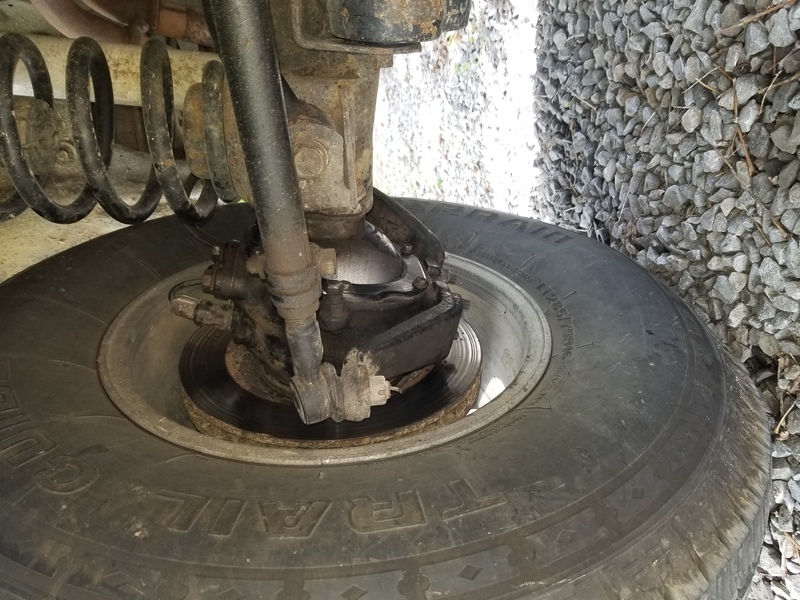 The old shocks were shot and the springs were beginning to sag. This led to some pretty aweful handling. 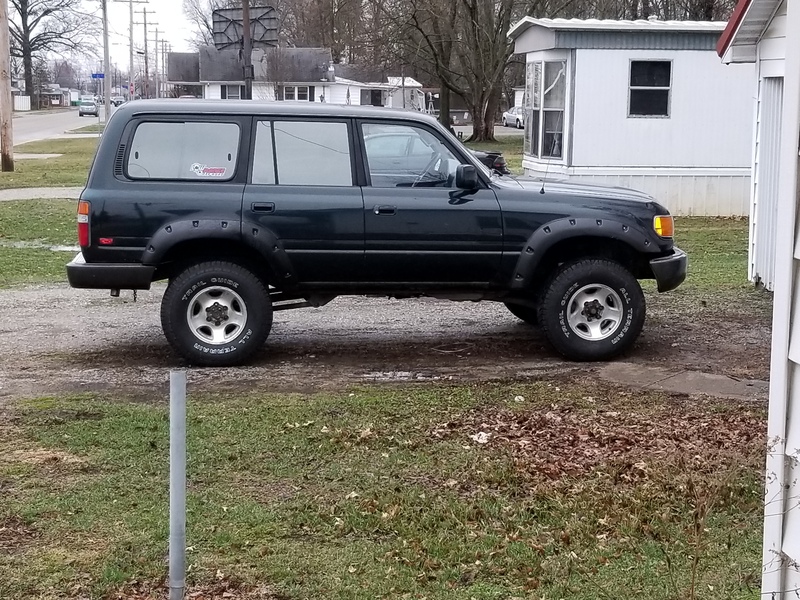 Now I need some 33" tires to go with the new lift. 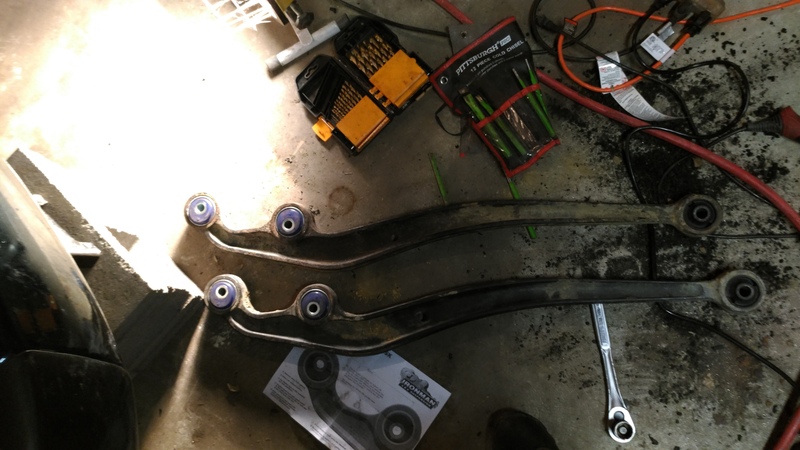 I decided to go ahead and replace all my front end bushings. 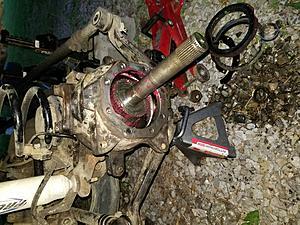 My handling wasn't great after lifting it and I also needed a way to put the castor angle back in spec. 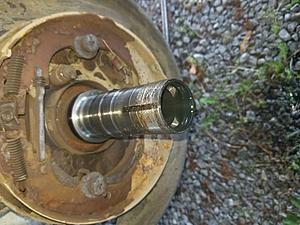 I replaced the panhard bar bushings and the radius arm bushings. 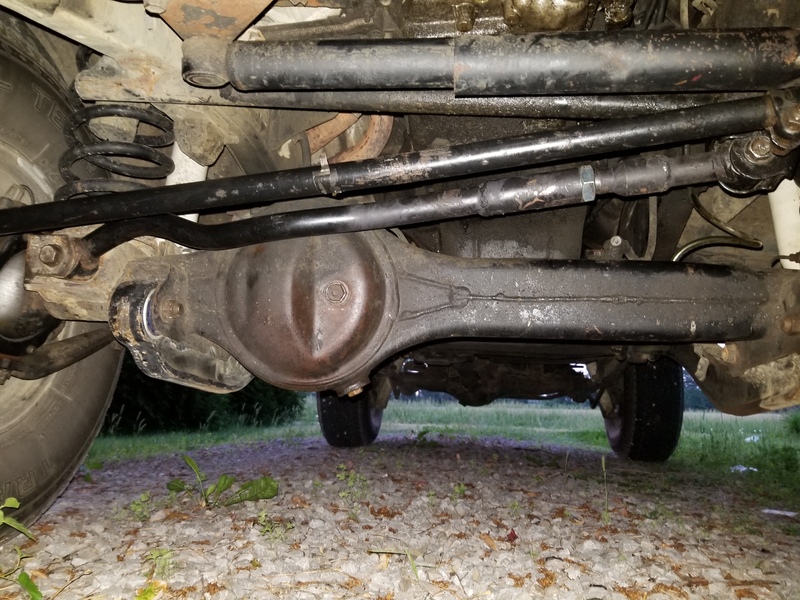 The lower radius arm bushings were 2° castor correction bushings from metaltech. I also put a 30mm spacer on the front coils because the front was not sitting nearly as high as the back. All the bushings had to be drilled out and cut with a sawz-all, but they pressed in easily with my 12T shop press. Re-instslling my radius arms was also a fight with my frame issues. 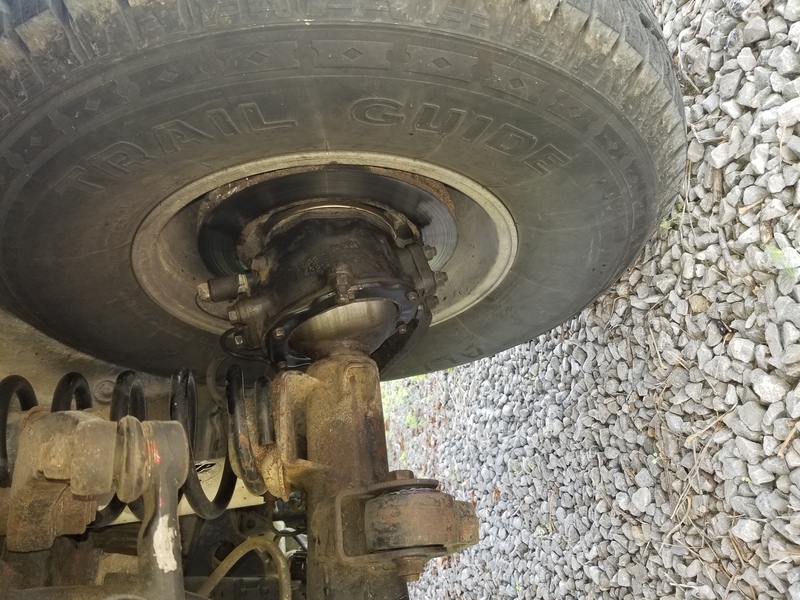 Now the truck rides much better, it cut out the darting tendency in the steering and the shimmying in the front end which I believe was worn bushings. 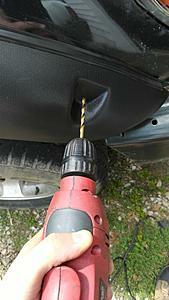 I also recenter the steeing wheel which was cake compared to my IFS pickup. You just spin the drag link one way or the other until the wheel is center then crank down the clamps. No need to worry about toe. I got tired of having no fender flares. 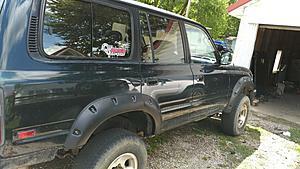 My wife kept making fun of the land cruiser for being naked. I went with cheap-o Chinese pocket fender flares. They were cheap but the freight cost was excessive. The first 2 pictures show the finished product. The next 2 show the "fitting" that had to be done. The edges were generally not contured correctly had ha to be cut. I also had to cut off the bottoms of the back of the flares. 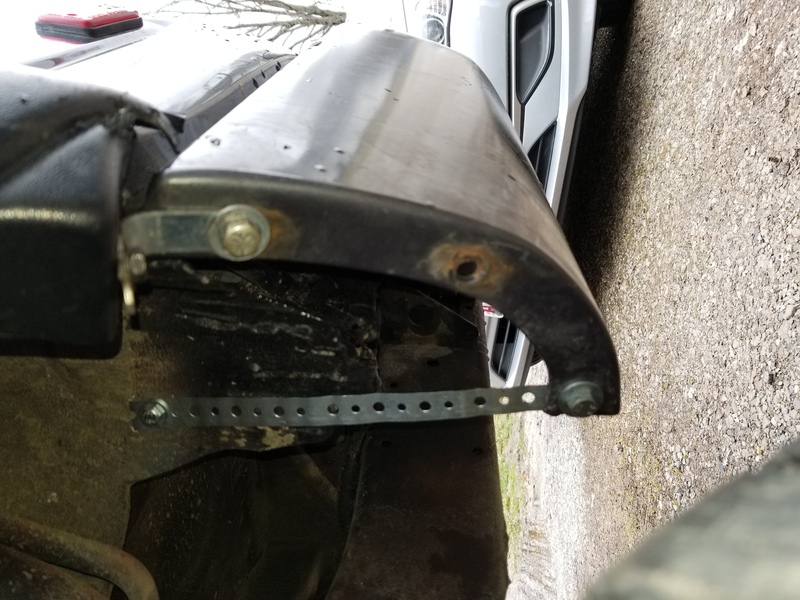 I think they were made for mud flaps that were on a different year than my 94. They also don't fill the little lines stamped into the sheet metal on the sides of the land cruiser. They just go across the top of those. 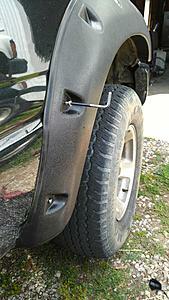 The were install by drilling a 3/16 hole and using a 5mm Allan wrench to screw them in. 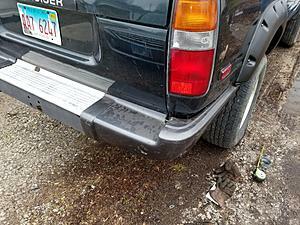 There is also a picture of where ill have to cut the bottom of the fender to clear my new rear bumper. I also had to out a spacer under the door piece because the little spacer they provided didn't keep it stuck out enough. I had to buy 2 sets as a minimum so ill be selling the second set on eBay to help cover all the money I paid to get them FedEx-ed from China. Over all I'd say they were worth it. The hardest part was the door piece, I had to cut out a ton of plastic to get the door where it could close again. Then after all that material was removed I had to add rubber spacers to get my contour right. The next hardest thing was getting the weather strip on and staying until I could get it screwed down. I feel like these take a little more skill than I have. A body shop could probably get these to be perfect. They certainly aren't for someone that doesn't want to do custom fitting. Make sure you glue in the little white caps for the seat. They tend to fall out and cause the rails to bind. Common problem. Thanks for the heads up! I'll have to go back and do that. 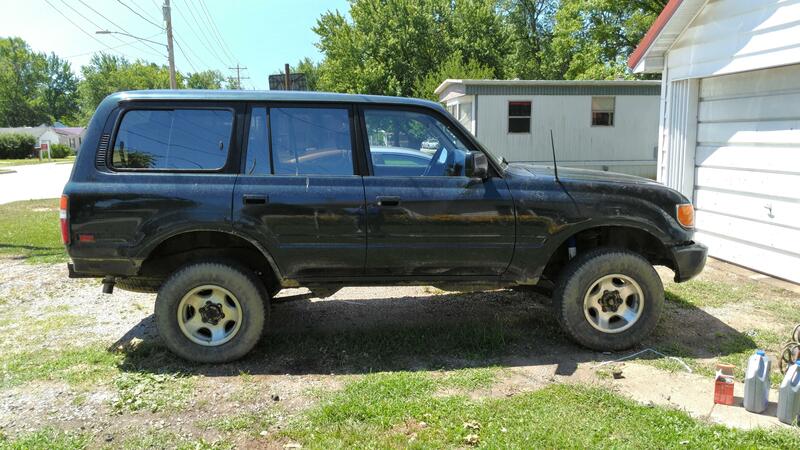 I finally got my land cruiser back from the body shop. He had it for 6 months. He said he tried everything under the sun to straighten the frame and couldn't. My next option is to get adjustable control arms in the back and adjustable panhard bars for both ends. 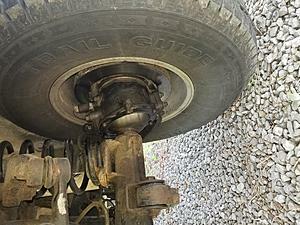 Then I can at east align the axles to each other, and cheat the body one way or the other to make it look correct. 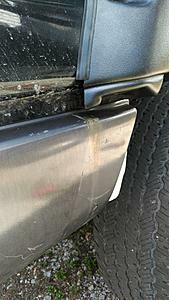 I went ahead and put on the bumper pieces I got from an online junk yard. I was missing a bunch of parts that hold the bumpers on. 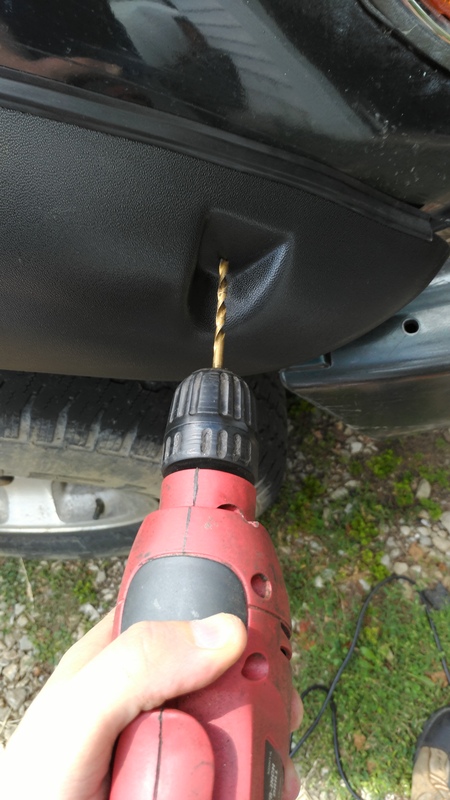 I only have 2 or 3 bolts holding it on in the back on each side. 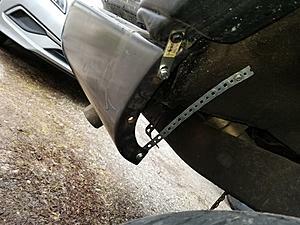 And I had to cheat on the front with some little metal brackets and pipe hanger. I got new tires. I went with 285 75s. Since my frame is bent, the front wheels aren't centered in my wheel wells so I was afraid 315s would rub. I will have to wait to get bigger tires until I figure our how to align the axles. They look way better than the stock 275s. 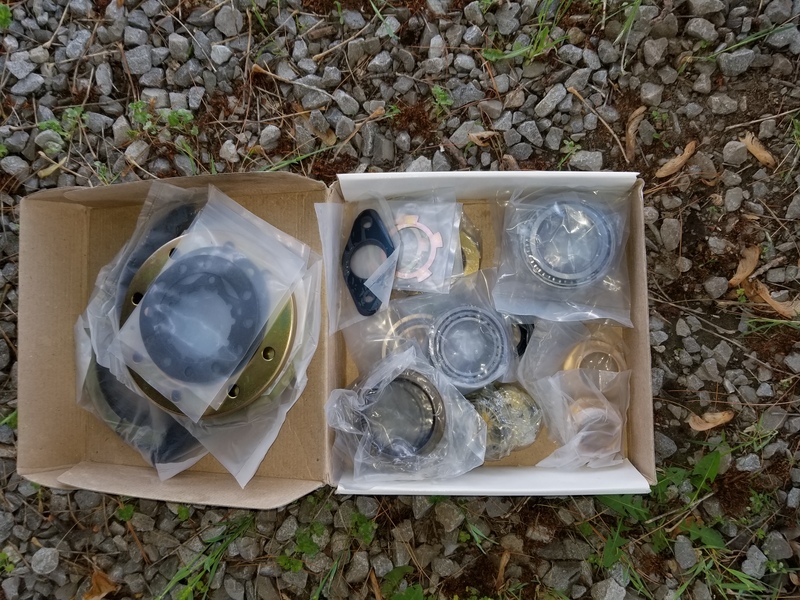 My front wheel bearings were bad so I got a trail gear service kit. I got the driver side apart this evening which was the worse sounding side. After I got my brake caliper off I realized that the brakes were the only thing holding my hub straight. 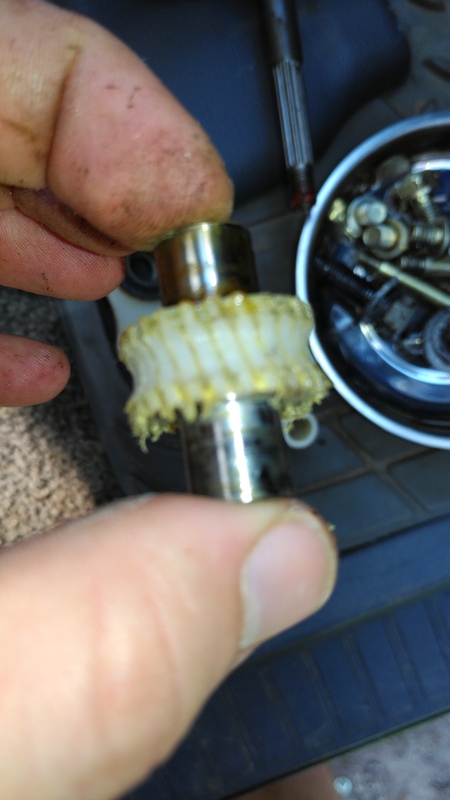 My outside bearing failed and the bearings were scattered in the hub. The bottom race was the only thing left. 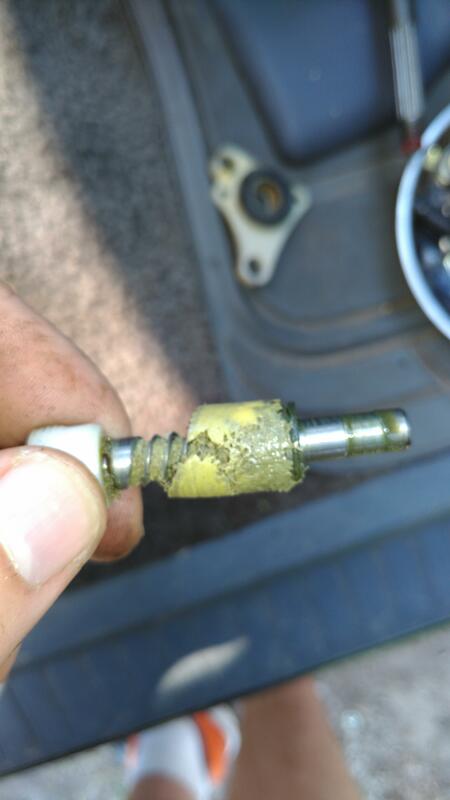 No wonder the hub moved and inch or two in every direction. I wonder how the passenger side is. 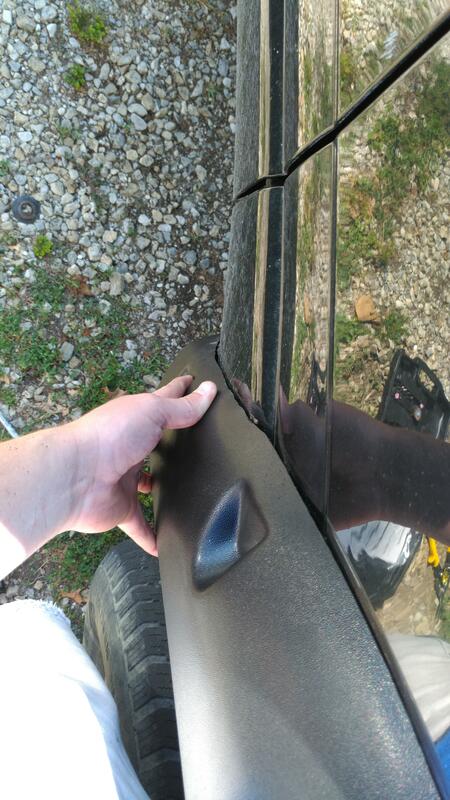 The passenger side came apart in about an hour. It's way easier when everything is in tact and I'm practiced up. 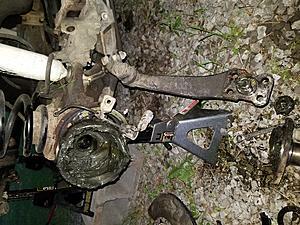 I got everything cleaned up and I reinstalled the steering knuckle on the passenger side. I only put in on loosely because it got dark outside and I had to wrap up. Hopefully I can finish up both sides tomorrow. I got the knuckles done today. 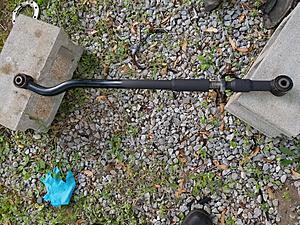 I ran out of time to get my adjustable panhard bar done. It drives much better now. Only problem now is that the toe in is set at dead even and I can't get the tie rod to budge. I prefer about 3/16 toe in. It wanders a tiny bit which is what I would expect with 0 toe in. 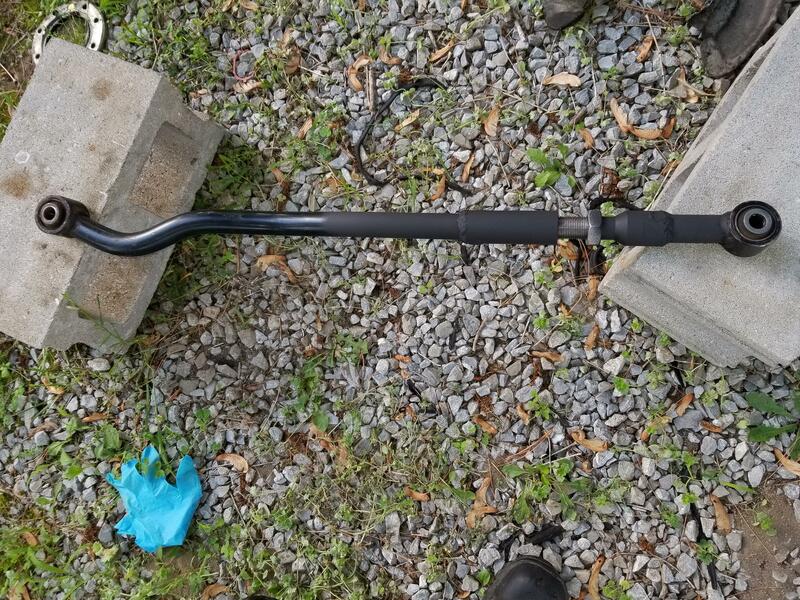 I'll have to replace the tie rod and both ends now. Maybe Monday I'll pull off the pan hard rod and weld in the adjustment. Also I cut out the dust cover. I still used the rings to get my spacing right, but I cut out the rest with a plasma cutter. 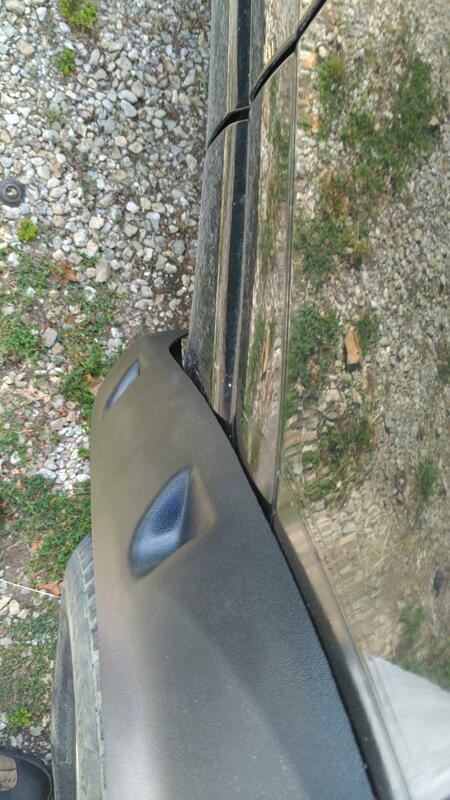 I dont like how they fill up with mud and rocks so I remove them when I can. I installed my front panhard har adjustment from Slee in an attempt to get the front axle in line with the rear one. There is 2 inches of adjustment in them. I cut my bar so that I had most of my adjustment in the shortening direction since my axle was sticking out on the passenger side. I pulled it about an inch towards the driver side. I left about a quarter inch more of travel in the panhard har if I need to bring it further. Just eyeballing it from the front of the truck it looks like its even now. I'll have to have my wife drive it and follow her to see. I went in and serviced my passenger rear bearings. I didn't take any more pictures since I've already covered that. But I have a pull scale now and I can pre load the bearings to factory spec. I re packed them, replaced the seals and set my preload to 10 or 12 lbs. 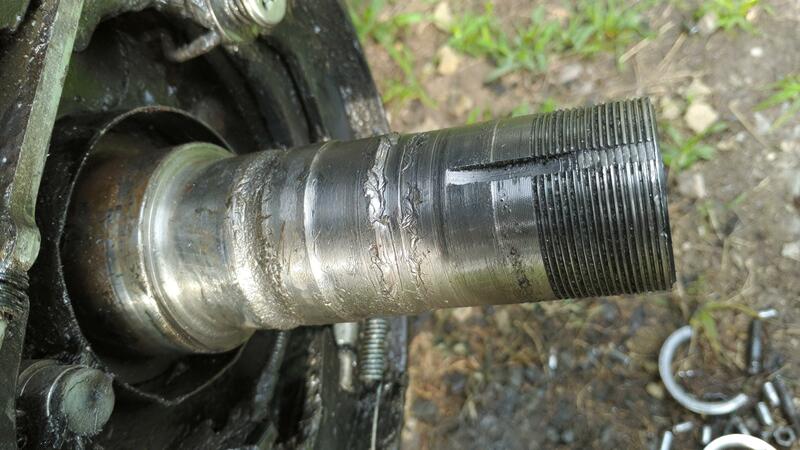 I'm also going to need to replace the spindle lock nut since mine is so chewed up from the bearing failure. But it should go till the next repack. Also on a side note, the "Centric" brand bearings from Rock Auto turned out to be Koyo bearings. I was pleasantly surprised. 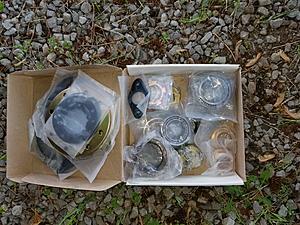 I know that because I ordered new bearings for the other side which I'll do tomorrow. I got my driver side rear bearings done. It was completely painless. 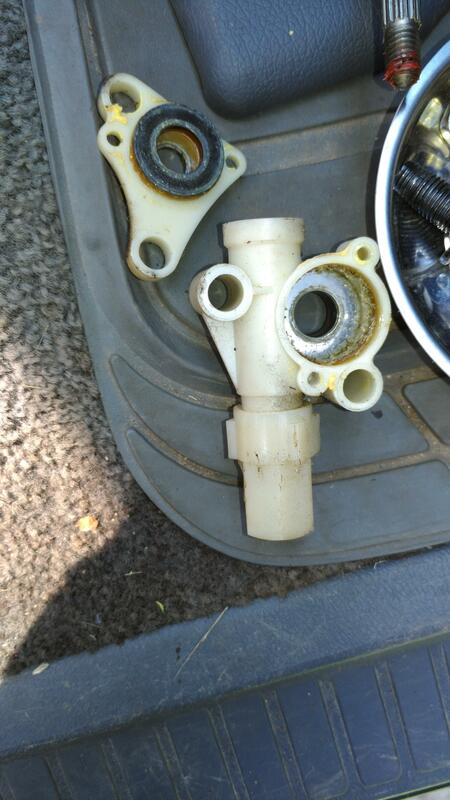 The old bearings were sloppy but still completely in tact. The seal had gone bad and let oil eat up the grease. If I do this very often, I'm going to buy a second spindle nut wrench and cut 3 slots in it to use on the spindle lock nut. Using a punch is tough to do without maring everything, mainly the spindle threads. There's also a picture of those koyo bearings. They were 8 and 10 dollars. With 4 dollar races. Not too bad for the same thing the Toyota dealership uses.